Mission style table lamp, with a solid oak base. 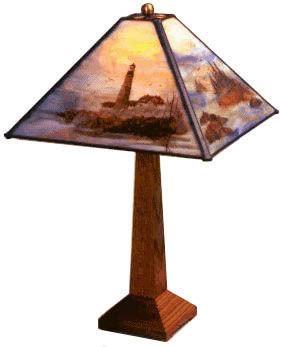 The lamp glass is decorated on all sides with Adirondack pictures inspired by the American landscape. The primary panel can be painted with your choice of wildlife or adirondack scene. Fly-fishermen and red canoes by the lake shore are our most popular designs. 22" high, Shade 13' Wide. Also available in 29" high version. Item: GL-CANM Price: $475 ea.